When you turn to Allen Samuels CDJR Aransas Pass near Corpus Christi for a used Jeep SUV, you’re getting more than just a great price on a tough used SUV. We offer many of the best used Jeeps on the market like the used Jeep Wrangler, and we even offer certified pre-owned models. Explore our selection of used Jeeps for sale today! 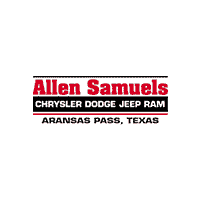 Why Shop for Used Jeeps at Allen Samuels CDJR Aransas Pass? For more information, contact us online today. We’re located just a short drive from Port Lavaca, and our customer service team is happy to assist you in finding out which Jeep is best for you. From the Jeep Grand Cherokee to the Jeep Compass, we’ll help you find the off-road ready SUV you’re looking for.